Being judged, Being ridiculed, Not being a good mom/wife/friend, Not being a good enough Christian, Public speaking, Getting old, Not being a good business owner, Not having enough money, Not having enough energy, Being too distracted, The dentist, Not having impact. Whew! Makes you want to reach for some Xanax huh? I didn’t love this exercise because it felt like I was moving backwards to list out the things that scared me. I’m a coach for crying out loud, I make my living helping people see and celebrate the positive. A miraculous thing happened though. When I went back and read what I wrote at the end of the week, a pattern started to emerge. I’m sure you had no problem seeing it, but I didn’t until I looked at my notes all together. My fears were almost exclusively about judgment and expectations (or more aptly put, ENOUGH). But who is judging me (other than myself) and what exactly is “enough”? These are nebulous concepts that come from a lack of confidence and a desire to please others. For example, I fear getting old because I haven’t always practiced self-care and need to take better care of myself in the future. That’s a fear I can do something about. I can exercise, eat better, and everything else will have to be left up to God and modern medicine. 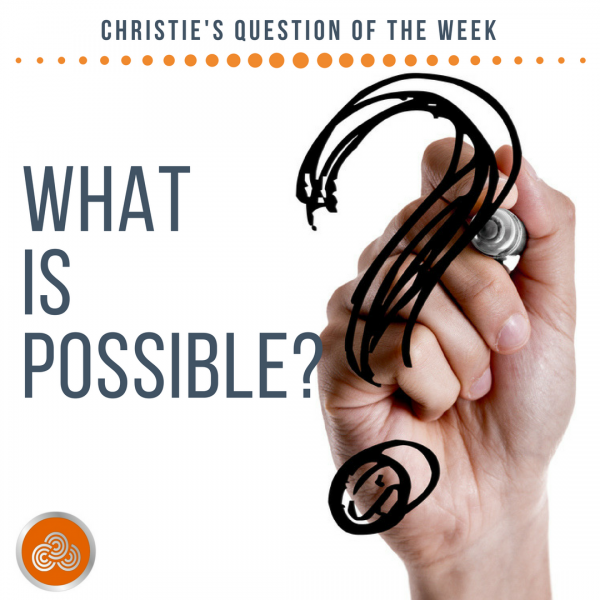 Now for a new Question of the Week: What is possible? You know the drill. Write down three things that come to mind when you ask yourself What is Possible. Do this each day and see what you discover. I’m interested to see what we each have at the end of the week.